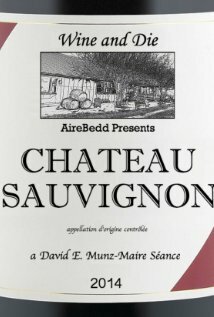 It isn’t very often I get to review shorts unless they are part of an anthology of some sort but I was contacted by director David Maire and asked if I would give his short, Chateau Sauvignon: terroir a view and I thought why not, it will be a quick watch and maybe I will find something interesting. I was actually a bit surprised in what I saw actually. I was expecting perhaps a low budget affair with so-so acting but what I got was a well performed and produced thirteen minute little horror show about a winery that likes to add a little extra flavor to their house wine. The short starts off with a young man named Nicholas (Michael Lorz) attending to his sick mother Eartha (Pooya Mohseni) at his family owned winery and doing what appears to be some kind of blood work operation on her. He then goes to attend to the duties of the winery and talk to his father Patrick (Sam Weil) about a few things which leads to some contention between the two and a slap to the face of Nicholas. Some visitors soon arrive at the winery where Nicholas tells them they are still open and allow them to come in to taste the wine. What plays out is that we discover the secret recipe to the wine and that traveling wine tasters eventually get to be tasted themselves in an odd vineyard circle of life. What struck me most about Chateua Sauvigon is how well it was all put together. From the acting which was top notch from everyone involved, the excellent look of the film which matches a lot of well funded theatrical releases and just the overall professionalism and direction of the film. The story itself isn’t groundbreaking but the way it is executed really makes the whole thing watchable and enjoyable. I wished some film makers of full length features would take a note from Chateau Sauvignon in how to at least execute a story because this short does it right. So if you Chateau Sauvigon: terroir shows up in place where you can watch it, I recommend you do…with nice big glass of wine. An interesting side note: the short was awarded a post-production grant from McDonalds which makes me wonder even more about what the fast food chain adds to its burgers and food?? ?